Let all of your cares simply melt away when you indulge in a vacation getaway at Sandos Cancun Luxury Experience Resort. 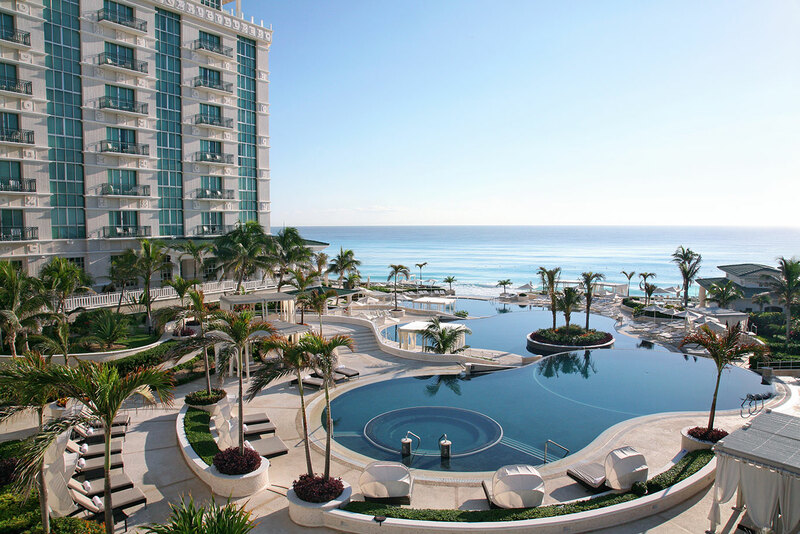 Situated in the center of the world famous Cancun Hotel Zone, this resort is set on a breathtaking stretch of white sand beach next to the intense turquoise tones of the Caribbean Sea. 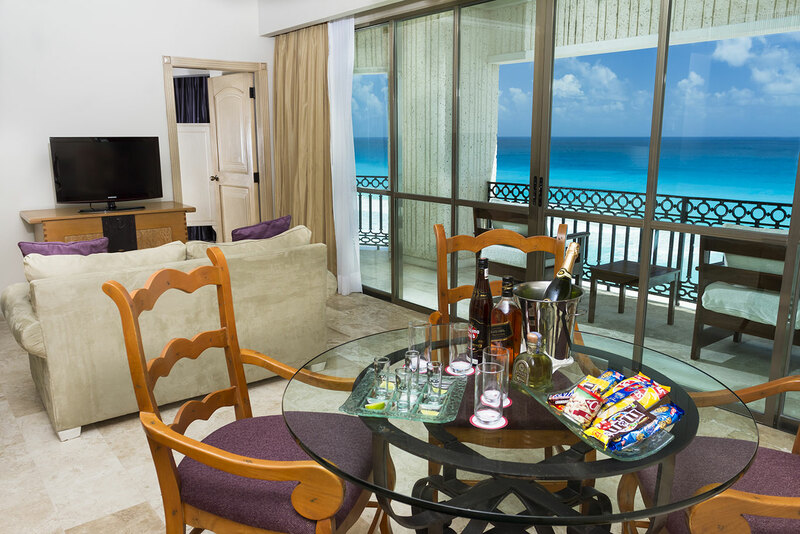 Sandos Cancun is an All Inclusive resort designed for travelers in search of quiet luxury on their next vacation. With an adults-oriented atmosphere, this beach hotel is the perfect spot to chase your worries away by spending your days by the pool and your evenings sampling amazing cuisine. 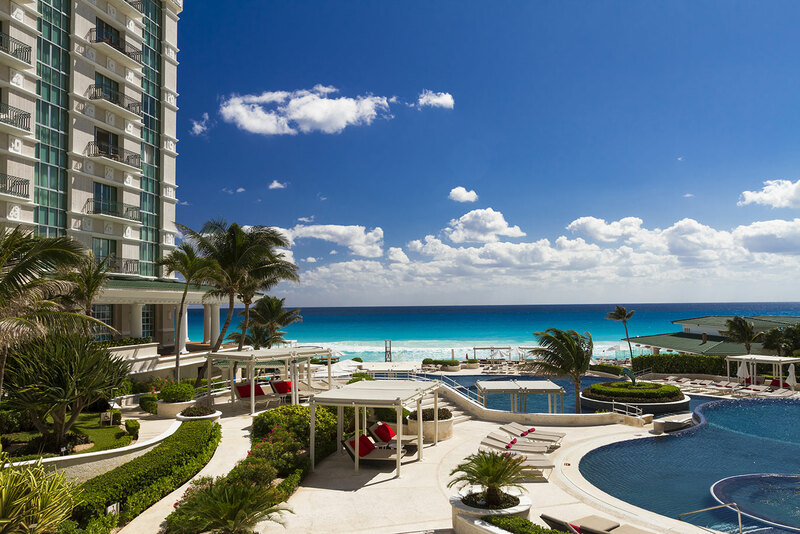 Our three tiered infinity pools descend down towards the beach, creating a stunning pool area that seems to blend with the Caribbean Sea.Sandos Cancun Luxury Experience Resort features the Total Gourmet Experience – our upscale version of the All Inclusive plan. You’ll have access to all kinds of amenities, including our on-site bars and gourmet restaurants, 24-hour room service, ocean view. Here, white sands lay side-by-side with the striking turquoise tones of the Caribbean Sea, the perfect place to spend every afternoon of your vacation. 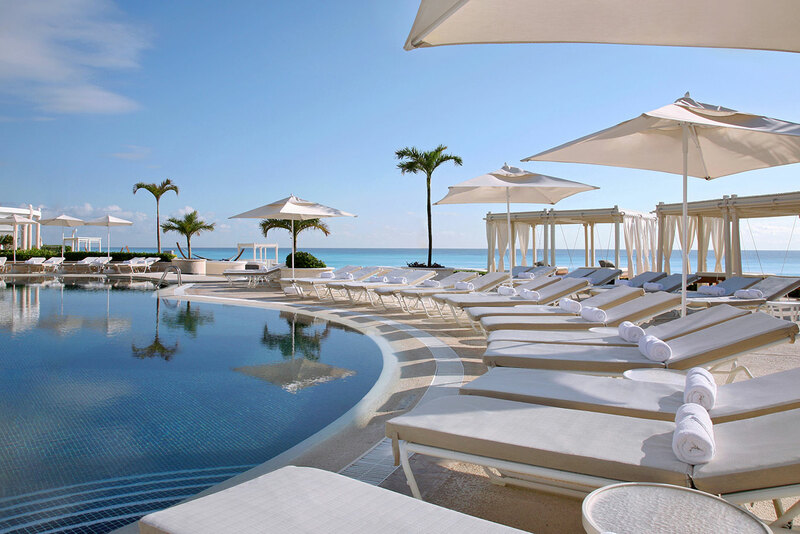 Lie out on a hanging bed under a breezy cabana, or choose an oceanfront spot on a comfortable lounger. Guests can enjoy beachside waiter service, beach volleyball and a variety of activities with our partner water sport center. Work out with Caribbean Sea views! Our 7,000 sq ft gym has been completely outfitted with Life Fitness equipment. You’ll find cardio and strength equipment with integrated TV and radio along with our own spinning room. Covering 15,000 sq ft, Spa del Mar offers you an idyllic place for relaxation, leisure and beauty. Our spa has 12 treatment rooms along with a Luxury Suite created exclusively for our Spa del Mar rituals. You’ll also find a private hydrotherapy area for men and women, a steam room, inhalation and sauna rooms, Jacuzzis, cold immersion pools and shower/locker areas. Our full-service beauty salon offers guests manicure, pedicure, hair and waxing services. You’ll fall in love with our collection of three infinity pools and one Jacuzzi, each offering poolside drink and snack service for a memorable day under the sun. The infinity pools cascade down towards the white sand beach and appear to fall right into the blue waters of the Caribbean Sea. 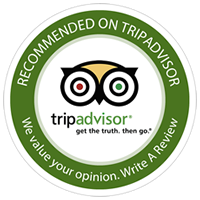 A private atmosphere, high-end service and a tropical vibe make for an unforgettable vacation. Our high-end, all-inclusive program offers every guest gourmet meals, unlimited national and imported drinks, 24-hour room service and access to our many activities.